Cost and Performance: Airtech is a long established supplier to the Motorsport industry, where extremely complex parts and very rapid short run production demands high performance and reliable materials. 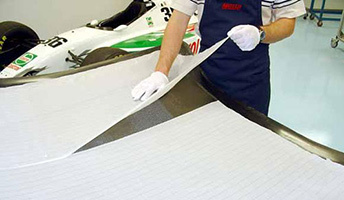 High elongation bagging films and release films from the Airtech catalog ensure consistent application of consolidation force through High pressure cycles on complex geometry parts. High temperature performance breather fabrics ensure continuous air & volatile removal through the entire cure cycle ensuring excellent laminate quality. Quality & Environmental Management Systems: Airtech International, Inc . maintains quality and environmental management systems in accordance with the requirements of ISO 9001:2015 / AS9100 Rev. D.